WEST LIBERTY, W.Va., Aug. 15, 2017 — Giving back to his alma mater is a way of life for West Liberty University alumnus Jack Adams. A 1963 graduate of what was then known as West Liberty State College, Adams earned his Bachelor of Science degree in Marketing and never forgot what he learned. 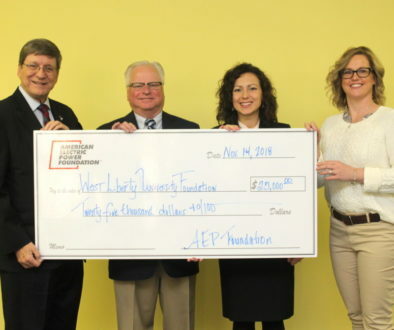 He is proud to have made the lead gift to the West Liberty University Foundation’s Jack Adams Hilltopper Athletic Club Endowment, which now carries his name as a nod to his legacy of giving. “I had a great experience at West Liberty and know that at West Liberty, sports are a big part of college life and student memories. Funding is vital and I’m pleased to help,” said Adams. Jack Adams (right) is shown with fellow donor Charlie Annett, another major benefactor whose gift supported the renovation of the West Family Stadium and for which the Charlie Annett ’66 Hospitality Box is named. 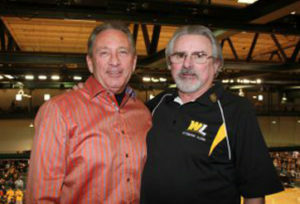 An avid fan and supporter of WLU Athletics, Adams can be found on the sidelines of most football and basketball games. He enjoys watching the competitions and takes a real interest in the players, introducing himself and maintaining friendships with many of the athletes, even after they graduate and move on to their professional careers. The Hilltopper Athletic Club (HAC) is open to all fans and offers its members VIP advantages with tickets and viewing, while also offering perks like Hilltopper Athletic apparel and special events. 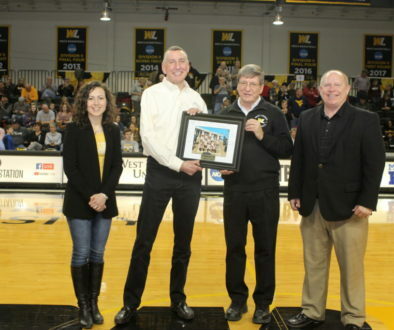 Managed by the West Liberty University Foundation, the HAC is the fundraising entity of athletics. The money raised through proceeds is deposited into this fund that supports all student-athletes and all of the men’s and women’s sport teams. The dollars go toward scholarships, departmental needs and capital improvements at the discretion of Athletic Director Lynn Ullom and Executive Director of the Foundation Angela Zambito-Hill. “We are so grateful to Jack for his leadership endowment gift. This important fund supports all our student athletes on an annual basis and now he has secured it for the future. For his inspirational gift, I thank him,” she said. Adams also is a member of the WLU Board of Governors and was inducted in the WLU Wall of Honor in 2012. “Alumni and friends can now provide much needed financial support by contributing to athletics via the HAC. It’s very easy to direct your gift in this manner,” Adams added. Adams was born in Washington, Pa. and is a resident of McMurray, Pa. He began his business career with Retail Credit Co. (Equifax). In 1967, Adams embarked on a 30-year career with Exxon Company, USA, in Marketing, Real Estate and Engineering. 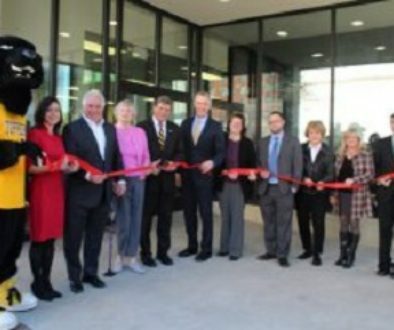 Retiring from Exxon in 1996, Adams became president of SJR Team Supreme, Inc., in Phoenixville/Valley Forge, Pa., which became a nationally recognized leader in Exxon convenience store marketing. After eight years, he again retired in 2004. Also a Vietnam Combat Veteran, Adams served with the U.S. Army Reserves 630th Trans. Co., Washington, Pa., one of only five reserve units activated during the War. Adams was a founding brother of the Delta Omega chapter of Delta Sigma Pi International Business Fraternity at WLU. He is a member of the Gary E. West College of Business Advisory Board, former member of the WLU Foundation Board of Directors, former board member of the Alumni Association and current treasurer for the Pittsburgh Chapter of the Alumni Association. The Hilltoppers are a charter member of the NCAA Division II Mountain East Conference with nearly 400 student-athletes participating across a broad spectrum of 18 intercollegiate sports. These include men’s football, cross country, basketball, wrestling, track, tennis, baseball and golf along with women’s softball, volleyball, cross country, basketball, track, tennis, golf and soccer. Most recently the university added women’s acrobatics and tumbling to the mix along with men’s soccer. West Liberty University offers nearly 70 undergraduate majors and 30 programs. Graduate programs include the Master of Arts in Education, the Master of Science in Physician Assistant Studies, the Master of Professional Studies, the Master of Science in Criminology, the online MBA and the new MA/MS in Biology. For more information on the WLU Foundation, please call Zambito-Hill at 304.281.0118.